British mobile chip designer ARM and the world's largest foundry for those TSMC have deepened their partnership to work on ARMs next generation silicon. The task is a die shrink to 20nm, from the current 28nm (Snapdragon S4) or 32nm (Exynos). Not only that, but those chips are supposed to be 64-bit, and utilize a TSMC's FinFET technology, which is similar to the current 22nm 3D transistors that Intel is using in its brand spanking new Ivy Bridge architecture. This collaboration brings two industry leaders together earlier than ever before to optimize our FinFET process with ARM's 64-bit processors and physical IP. We can successfully achieve targets for high speed, low voltage and low leakage, thereby satisfying the requirements of our mutual customers and meeting their time-to-market goals. Advancing the clock frequencies while keeping the same frugal power consumption ARM chips are known for, are the key factors for the widespread adoption of the RISC architecture even beyond the mobile realm. After 20nm chips, ARM and TSMC are continuing the partnership all the way down to 15nm. Hsinchu, Taiwan and Cambridge, UK – July 23, 2012 – TSMC (TWSE: 2330, NYSE: TSM) and ARM today announced a multi-year agreement extending their collaboration beyond 20-nanometer (nm) technology to deliver ARM processors on FinFET transistors, enabling the fabless industry to extend its market leadership in application processors. The collaboration will optimize the next generation of 64-bit ARM® processors based on the ARMv8 architecture, ARM Artisan® physical intellectual property (IP), and TSMC's FinFET process technology for use in mobile and enterprise markets that require both high performance and energy efficiency. The collaboration will enable sharing of technical information and feedback between the two companies, enhancing the development of ARM IP and TSMC process technology. ARM will leverage process information to optimize the power, performance and area (PPA) of the overall solution to reduce risk and encourage early adoption. TSMC will use the latest ARM processors and technology to benchmark and tune advanced FinFET process technologies. The combination of TSMC FinFET technology and ARMv8 architecture provides the fabless industry with solutions for continued innovation across diverse market segments. The collaboration will result in improved silicon process, physical IP and processor technology that together will enable new system-on-chip (SoC) innovation and shorten time-to-market. The ARMv8 architecture extends ARM low-power leadership with a new energy-efficient 64-bit execution state to meet the performance demands of high-end mobile, enterprise and server applications. The 64-bit architecture has been designed specifically to enable energy-efficient implementations. Similarly, the 64-bit memory addressing and high-end performance are necessary to enable enterprise computing and network infrastructure that are fundamental for the mobile and cloud-computing markets. TSMC's FinFET process promises impressive speed and power improvements as well as leakage reduction. All of these advantages overcome challenges that have become critical barriers to further scaling of advanced SoC technology. ARM processors and physical IP will be able to leverage these attributes to maintain market leadership, while the companies' mutual customers can benefit from these improvements for their new, innovative SoC designs. "By working closely with TSMC, we are able to leverage TSMC's ability to quickly ramp volume production of highly integrated SoCs in advanced silicon process technology," said Simon Segars, executive vice president and general manager, processor and physical IP divisions, ARM. "The ongoing deep collaboration with TSMC provides customers earlier access to FinFET technology to bring high-performance, power-efficient products to market." "This collaboration brings two industry leaders together earlier than ever before to optimize our FinFET process with ARM's 64-bit processors and physical IP," said Cliff Hou, vice president, TSMC Research & Development. "We can successfully achieve targets for high speed, low voltage and low leakage, thereby satisfying the requirements of our mutual customers and meeting their time-to-market goals." Samsung must be fuming now. 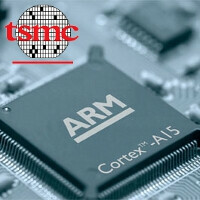 That is a hard macro SoC of ARM, and TSMC is the fab that producing it. TSMC has been doing it for quite a long time (Cortex A9 and Cortex A15 hard macro). It does not affect very much on the licencees like Samsung or nVIDIA. You are funny ! But probably correct. Hey that is how tech moves. Samsung will rebound & make some great processors for next year’s phones & tablets. In this business tech just moves at the speed of light. Samsung produces chips for their own products, and sells some on the side. Nah, they won't be affected much. I'm guessing the 28nm of Samsung will be at par with the 20nm of these guys. OMG, I just sat here and stared at the screen, and I realized that I think I figured out how SoC's work. Correct me if I'm wrong but like a 65nm chipset compared to a 20 nm chipset clocked at one gigahertz is going to be less efficient because although they are different sizes, the 20nm chipset will have a proportionally higher clock speed. But since it is smaller, it would draw on less speed. Lets say if they were the same size, the 20nm, chipset would actually be clocked at more than 3 gigahertz, if the clock speed was keapt the same in the 20nm chipset as it blows up to the size of the 65 nm one. I feel like I'm wrong some one tell me if I'm right or not. And what architecture ate the Krait CPUs? Would they be the equivalent of A9s, A15s or something kinda inbetween? If you take a step back and think about the amount of energy an electron has to move for bigger chips versus smaller chips, it's easy to that the same electron doesn't travel as far, has less resistance, etc. in the smaller chips. I am generalizing here but you get the picture. Power consumption is roughly proportional to node cap * voltage ^2 * frequency. I'm talking about only dynamic power that gets used as transistors keep switching. Die shrink scales cap down - so it allows for a scaled up freq. for around same power budget. Of course, there are leakage/static power (say about 30% of the total power) that actually goes up with die shrink. So freq. really doesn't scale up that much. Or power savings is not as much - still significant. Then there is pipleline depth - which tends to increase for higher throughput leading to higher clock freq. So yeah - you probably get the idea. Krait is A15 equivalent implementation of Qualcomm - both are based on the same instruction set (that the SW sees). Unlike most others, Qualcomm designs its own core architecture. Think about AMD & Intel for example - they both implement X86 instruction set but the underlying HW architectures are significantly different. Until we run a krait and A15 (designed by ARM itself) next to each other, it's hard to say which one's better - at least at this point.